Bennett Miller’s follow-up to Moneyball is a meticulously crafted, errie, yet ultimately laborious and obscure drama. Forever living in his brother’s shadow, former Olympic winning wrestler Mark Schultz (Channing Tatum) enters into an intense and destructive partnership with millionaire John Du Pont (Steve Carell). 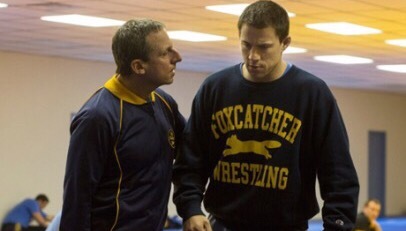 Based on real life events, Foxcatcher benefits from nuaned, unflinching performances from its core trio Carell, Tatum and Mark Ruffalo as Mark’s brother Dave. They’re arguably miles better than the script, which makes a strident point at being cold and calculated, much to the audiences’ disadvantage. There’s a lot bubbling under the surface, from sexual tension to sibling rivalry, but none of it ever pierces the surface in a way that awards the denoument the long-awaited shock it deserves. Miller creates tension astoundingly well, and the actors bring their all, but when there’s little depth and true character penetration to back it up (Mark could have been fleshed out more, while John’s motivations are left unclear), all that’s left is a well-meaning film without the requisite bite.